At TEAMM and AM News, we like to celebrate when our members receive recognition for their accomplishments. 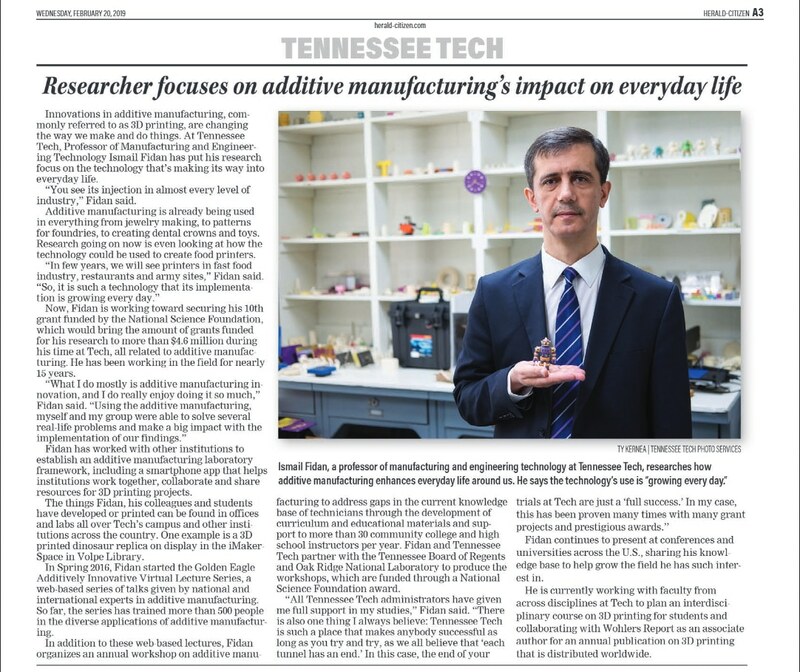 Recently, Dr. Ismail Fidan from Tennessee Tech University (TTU) was profiled in the regional newspaper, the Cookeville Herald-Citizen, for being a researcher focused on how additive manufacturing is making an impact on everyday life. The profile also mentions how he has worked “with other institutions to establish an additive manufacturing laboratory framework, including a smartphone app that helps institutions work together, collaborate and share resources for 3D printing projects.” This includes the AM lab at Edmonds Community College. AM News, of course, has written about the importance of Dr. Fidan’s Golden Eagle Additively Innovative Virtual Lecture Series (SEE NOTE for last two events for Spring 2019 below), a web-based presentation series given by national and international experts in additive manufacturing. So far, the series has trained more than 500 people in the diverse applications of additive manufactur­ing. In addition to these web-based lectures, Fidan organizes an annual workshop on additive manufacturing to address gaps in the current knowledge base of technicians through the development of curriculum and educational materials and sup­port to more than 30 community college and high school instructors per year. Thursday, April 18: Project iGen: Using Additive Manufacturing for Service Learning with Amy Fricks, Math Teacher, DeKalb County High School, Tennessee. You can also peruse the entire 2016 through 2018 Additively Innovative Lecture Series archive here. Hats off to Dr. Fidan for the recent media mention as well as his commitment to the combination of additive manufacturing and technician education.